Here are some images I took with the iPhone while i was away. Most of these were taken at times when I didn’t have the DSLR with me, i.e. I wasn’t on what I was expecting to be a photographic excursion, but then I ran into a scene that I wanted to capture. One or two of them already appear in other posts – apologies for the repeat. One of the things I had wanted to do last year but never managed was to walk along the Southern Ridges. This is a laid-out path (or series of paths) that link a number of open spaces just behind the south coast of Singapore island. It stretches a few miles – I joined it at Kent Ridge which is not the westernmost end of it, and walked through Hort Park, Telok Blangah, Mount Faber, and finally down the Marang Trail back to the MRT. These areas are all green (in different ways) and in some cases quite hilly, but are all separated by busy roads; but since the creation of the Southern Ridges walk, they’re all connected by paths running above the roads – in a couple of cases, dramatically high above the roads. I got there by MRT to Pasir Panjang, then walking back eastwards along a busy road to a Pepys Road which leads off to the north side of the busy road, and then walked up Pepys Road until I reached the edge of Kent Ridge. This was actually at the eastern end of Kent Ridge, so initially I walked westwards for a half-a-mile or so, fully in the knowledge that I would be retracing my steps in a short while. 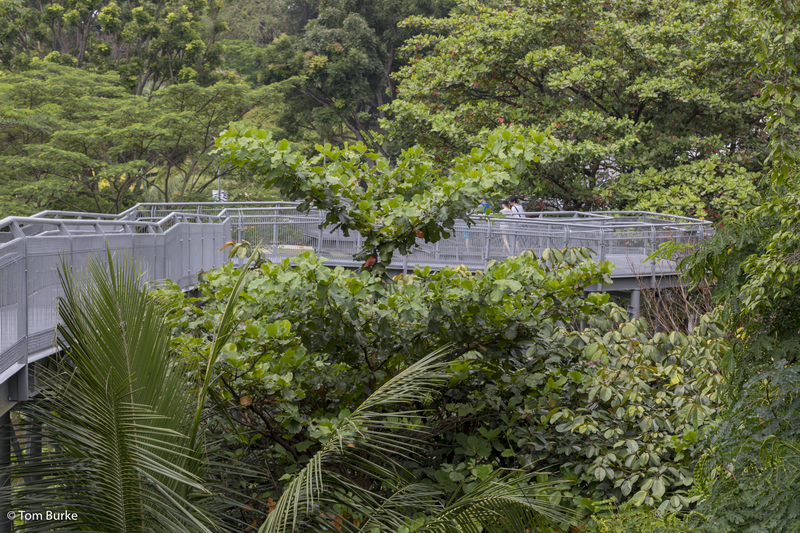 I was a bit disappointed to find that the Kent Ridge Forest Walk (a tree-top high level walkway) was closed for maintenance, but it turned out that there were other high-level walkways later. Kent Ridge was quite manicured, and I stopped and started retracing my steps when it became obvious that I was approaching an area that looked more like a park. I did reach a viewpoint and was taken by an old information board that showed an explanatory picture of the view. However, the board hasn’t been updated for quite a few years, and the view has changed a lot…. Old picture of the same view! I arrived home on Thursday 1 March in the early morning – I disembarked from the airplane at about 7:20, at Manchester airport. Readers, that was a shock. I don’t think I’ve ever seen Manchester airport look welcoming but that morning it was especially not so. The previous day I had been in Kuala Lumpur in temperatures a bit above 32°C, and in Manchester it was somewhere below 32°F; and unfortunately I was mainly dressed for Kuala Lumpur. But I had a plan – a heavier pair of trousers was at the top of my case, along with a jacket and a waterproof, so I repaired to the gents loo and (with a bit of a struggle) changed. Then I had time for a cup of tea in the Arrivals hall before heading off to the airport station for my train home. On my second day in KL I went for a ride on the Hop-on/Hop-off bus. I hopped-off at various points but the main stay was at the Kuala Lumpur Bird Park. This is located in a large green area just to the west of the city centre – other attractions here include a zoo, public gardens for walking around, various botanical gardens and a butterfly park. The National Mosque is on the edge of this area, as is the Malaysian Houses of Parliament. 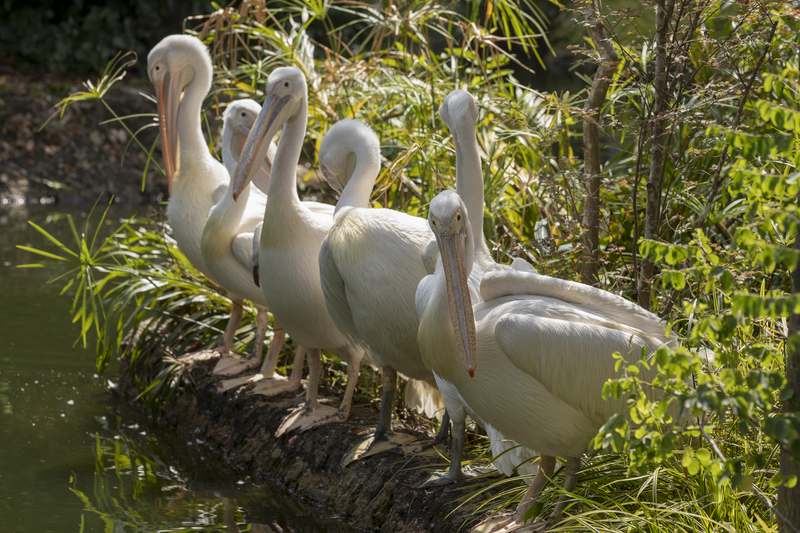 The Bird Park advertises itself as the “World’s largest free-flight walk-in aviary”. I can’t comment on that claim, but I spent an enjoyable two-and-a-half hours here. I can’t say it was spectacular, but it was peaceful and relaxing. It was also very hot, of course, and to be fair a number of the birds were pretty motionless – perhaps they’re more active early in the morning or the evening? Nonetheless it was enjoyable being to see the birds close-up – to walk around among them, in fact. There were some areas where the birds were caged, and those parts were less fun. The parrot house was one such, although there was a hierarchy of enclosures. Some species of parrot (I’ll call them all parrots even though there were in fact a variety of species there) were in quite small enclosures while a couple of other species were flying freely within the overall parrot house; and indeed, to interact with the visitors. I’m not sure why some parrots were kept in smaller enclosures – perhaps they’re aggressive with other species? At the end of the visit I went outside and waited for a Ho/Ho bus. Readers, that turned out to be the hardest part of the day. It was mid-afternoon by this time and therefore very hot and humid, and I had to wait about 30 minutes for the bus, with nothing to take my mind off my discomfort. Given that my intention at that point was simply to return to the hotel, it might have been better to get a taxi. On the other hand, however, if I’d done that I wouldn’t have seen the Petronas Towers, which I passed and took pictures of once I was on the Ho/Ho bus. You can’t win them all. Here are a few pictures I took in KL city. First, in the Pavilion shopping mall in Bukit Bintang. This was just a few minutes walk from my hotel, in the midst of some very busy streets. It’s a very high-end mall: lots of the top names (e.g. Prada, Cartier, Rolex) have stores there. So do some other names that don’t seem quite so high-end: Dorothy Perkins (!) and T. M Lewin (!!). But maybe those brands seem more exotic from the perspective of Asia. Inside the Mall main atrium – pink! The National Palace is where Malaysia’s Head of State resides. Malaysia has a totally unique constitutional model – an elected constitutional monarch. It all goes back to the situation at the time Malaysia independence in 1957. At that time the Federation of Malaya consisted of two British colonies (Penang and Malacca) and nine Sultanates. In 1957 they decided to adopt something quite like the British model and have constitutional monarchy but with the government being drawn from members of parliament. But who should become the monarch? There had always been nine Sultanates; some bigger, some smaller, but all theoretically equal in status. So they decided to rank the Sultans in terms of seniority (length of time as Sultan); then the most senior Sultan at the time of independence would become the King (and head of state) for a term of five years. At the end of that time the first King would be followed by the current Sultan of the next Sultanate, in terms fo the 1957 seniority list. However, although everyone knows who the next King will be, they go through a form of election: the nine Sultans vote for next King, it’s just that the ballot paper only has one name on it, that of the agreed Sultan! I have to say that however strange it seems, it has served them well ever since 1957. And finally a few images from a visit I made to the National Museum. I didn’t go in, just took some pictures of the exterior of the whole museum, and of the interior of a “Village Chief’s House” that has been erected in the grounds. 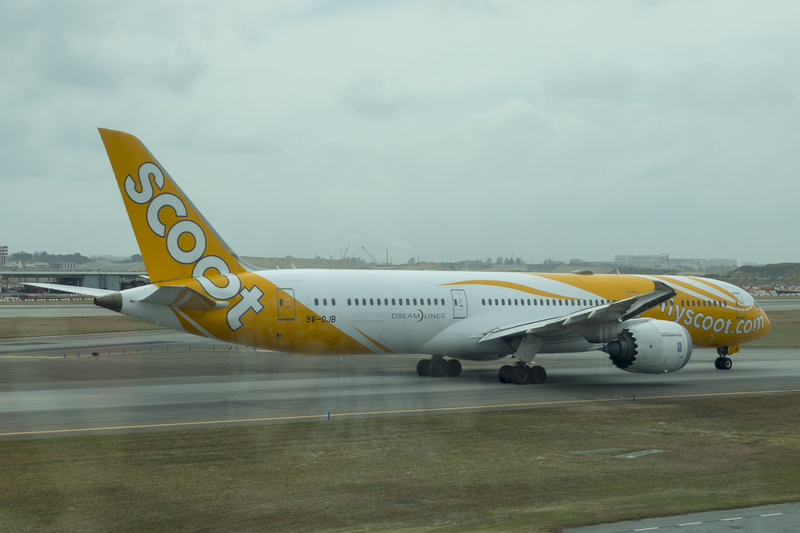 At Singapore airport – I just liked the airline name. Which the usual abbreviation for Kuala Lumpur, of course – the capital of Malaysia. I’m spending two nights here before heading home. I flew in to KL International just after lunchtime on Monday. The flight time from Singapore was given as 1 hour, but in fact only 40 minutes of that was in the air. No sooner had we got to our cruising altitude of about 35000 feet than we were beginning the descent. But the flight attendants managed to get refreshments round to everyone and to tidy up afterwards, though the refreshments were just a small packet of peanuts and a carton of orange juice. KLIA is over 50 kms from the city, so my transfer took about an hour, and was a quite frightening hour at that. It wasn’t that my driver was speeding, just that lane discipline while driving along the motorways seemed to be missing, not only my driver but all around him. There were a number of times when both the car I was in and another vehicle were veering towards each other. We also seemed to drive for miles straddling the white line between two lanes. I now see why the riders of the little motorbikes zip around so much and so quickly – it’s to stay clear of all the randomly-driven cars…. Part – just part! – of the room. However I did arrive safely at my hotel, the ParkRoyal Kuala Lumpur. This is now my third stay at one of these hotels, the previous two having been at the ParkRoyal on Kitchener in Singapore. That hotel is a solid 4* and perfectly good, but this in KL is more like 4*+. And I found I’m booked into their ‘Orchid Club’ – better and bigger rooms, and use of a separate club area, including a large lounge on the 6th floor where I took breakfast, afternoon refreshments and soft drinks, and early evening canapés and drinks. The latter two – ok, mainly the last one – was a huge pleasure. The canapés could actually be a complete meal if you took a generous portion of all the food on offer – let me say that I didn’t. But they had wine, and they kept coming round and offering to refill my glass, and who was I to refuse? 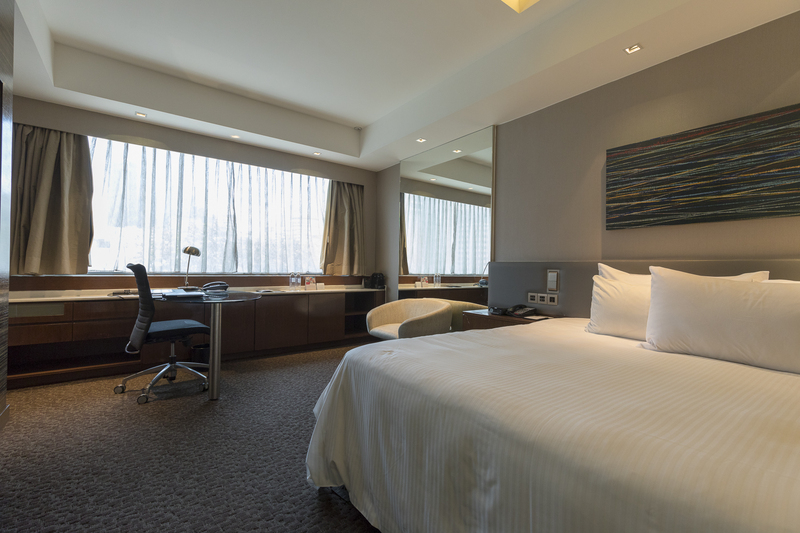 The hotel is in one of the most commercial ares of KL, Bukit Bintang, home to glitzy malls. I went out for a while later on Monday and explored locally, and again late in the evening. My first impressions of KL at the end of the day were that it was noisier than Singapore; more vibrant with lots of energy, but also harder. For example, walking down a street of eateries and being accosted every 30 seconds by the greeters for each one. The traffic seemed worse – more congestion than in Singapore – and the public transport system seemed to be more fragmentary. (Apparently not many people use the in-city systems which consists 3 or 4 monorails and a couple of subway lines. Possibly the fact that they’re not well integrated and may not share a ticketing system has something so do with that). And finally, lots of things seem a little unfinished, whereas in Singapore everything is just-so. (Of course, many people would prefer the KL approach.) It might be a city you could come to love, but I think it’s a city where it takes more effort just to be comfortable. And of course it’s hot – a couple of degrees more so than Singapore. Tomorrow I’m going out for the day, and I shall report back. More pictures in day or so, too – I have most of the walk-around images on the phone and not available to me at the moment. On Saturday night I went to Chingay. This is a parade to celebrate the end of the Chinese New Year celebrations. It was first held in 1973 as a fairly impromptu affair in Chinatown and featuring Chinese parade artists representing just the Singaporean Chinese community. I think there were then a few years when it didn’t take place but by the end of the 70s the idea had been resurrected but also altered: from then on it would include and feature artists and groups representing all the communities in Singapore. Indeed, presently there are also a number of international groups represented, certainly including Malaysian groups and also others (I remember a Japanese float, for example). It has also grown – this year there were about 6,500 performers. It’s held over two nights in the pit lane of the Singapore F1 circuit which is several hundred metres long, and grandstands are erected which can hold thousands of people. The government of Singapore estimate that if you include all the street parties and impromptu parades that label themselves as part of Chingay then the total audience is around 200,000. 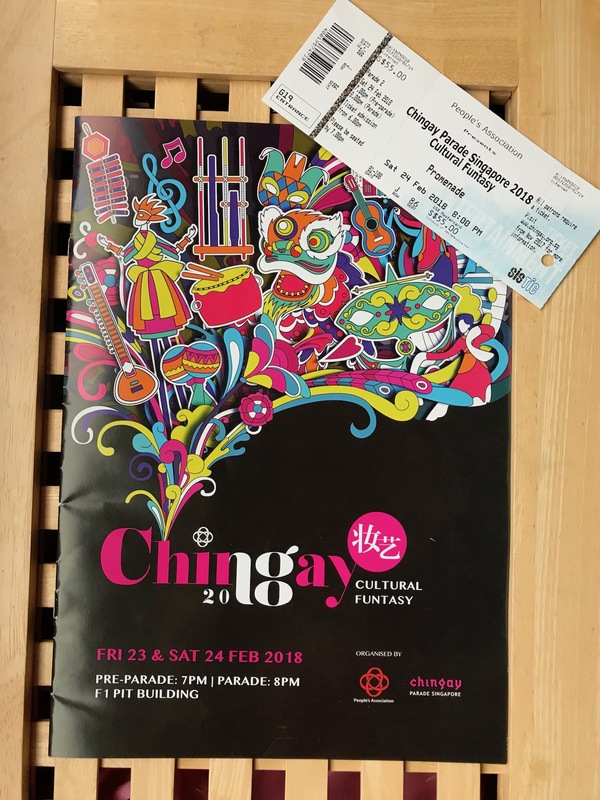 I’d heard about Chingay when I was in Singapore in 2017, but I’d missed it – I was there in March and in any case the Chinese New Year was earlier in 2017. 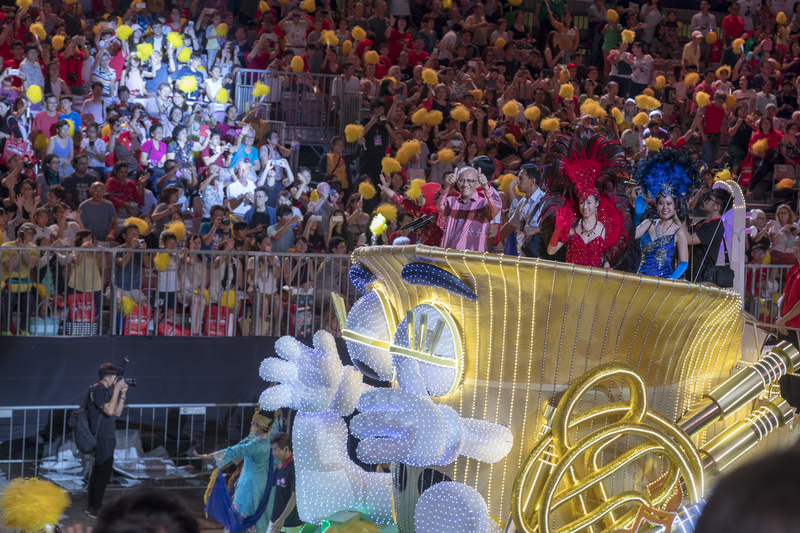 But for this year – 2018 – it was later and the two nights of the Chingay parade would be the 23rd and 24th of February. Given that I had already determined to return to Singapore, I decided to organise the visit around attending Chingay. I was able to buy a ticket online well in advance (cost S$55), and I was able to exchange the email voucher I received for the actual ticket without any problems at a Mall near to my hotel. I took my seat just before 7 o’clock, and there was then about an hour of warm-up acts – lots of chat be the presenters for the differentsections (A, B & C, reflecting the fact that it would take some minutes for a float or group to walk along the length of the parade), and some less formal dance acts. The parade proper started at 8pm with the first float containing, among other people, the President of Singapore together with her husband. (That’s him in the picture above), and it finished just about 9:30 with a fireworks display. Afterwards it took me about 90 minutes to get back to the hotel! – the problem was that many thousands of people were exiting the grandstands at the same time and were therefore overwhelming the public transport options. Indeed, even walking was directed along routes that the police knew to be easy to walk along, and I’d walked about a mile before I was able to branch out on an independent route. I had hoped to take lots of pictures but that turned out to be a problem. The angle of the grandstand seats meant that people’s heads in the rows in front were always in the pictures, and if it wasn’t their heads, then it was their mobile phones or most annoyingly of all, their d****d Pom-Poms. I did have a bit of success holding the camera up in the air, pointing it in vaguely the right direction, and hoping. But that was probably annoying the hell out of the people behind me. Still, at least I wasn’t (in the main) obstructing their view with my Pom-Pom. Oh no. So how was it? Well, it’s a world-class parade, which says it all, really: as parades go this is one of the very best, but when all’s said and done it’s just a parade. I had a great time; it was an experience I won’t forget; I’ve got some souvenirs (ask me nicely and I’ll show you my Pom-Pom); but to be honest, I don’t feel any need to do it again. But it was definitely worth doing this one time. Actually, I gather that the idea of a Chinatown in a city that is predominantly ethnically Chinese anyway is a fairly recent invention – post-independence. 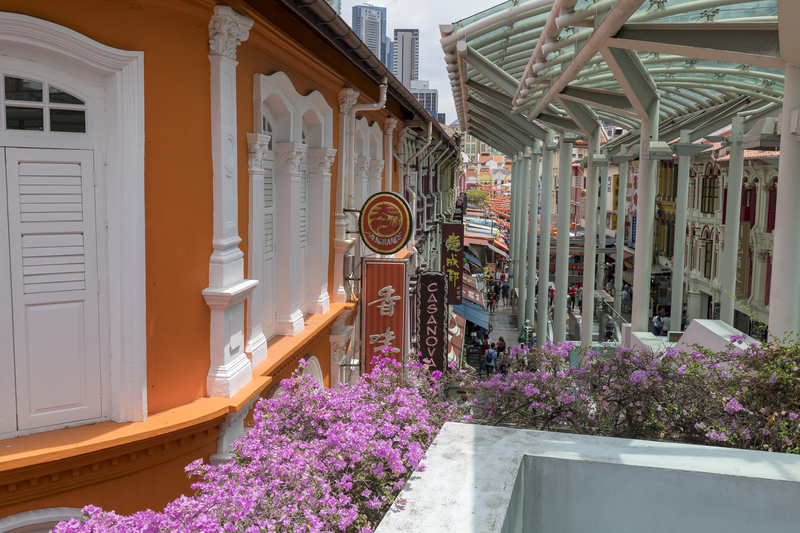 They’ve designated the area that was originally specified by Raffles (or one of his people) as the area where the Chinese would live – other areas were Indian, Malay and European residents (guess which group got the best area? ), plus large spaces for business and colonial administration. And right from the start the areas started leaking – no-one stayed in their own area for long (except the europeans who didn’t move into other areas, and into whose own areas no-one else moved). Today, for example, there is a mosque and a Hindu temple within the boundaries of Chinatown, and those would be unusual choices of religion for anyone who was ethnically Chinese. But this is Singapore where there are unexpected juxtapositions all over the city, so it’s no surprise really. These are another couple of things that I didn’t do last year, despite hearing that they were excellent, Well, today I did them – or perhaps they did me, I am back at my hotel at 10:15 and am absolutely shattered. I went to the zoo straight after breakfast. It’s somewhere in the middle-ish of Singapore Island, and is therefore some distance from the city (which is on the southern tip of the island). In fact it took just over an hour to get there – about 30 minutes on the metro followed by a bus ride of more than 30 minutes. The metro ride was to a place called ‘Ang Mo Kio’ which is a dormitory new town. In fact, it was one of the first new towns to be built after independence in the mid-60s. It was built during the 70s as a planned residential area, with the previous kampongs (traditional villages), agricultural land and swamps all replaced. It’s a place of tower blocks and grid-plan roads, and a new-build town centre which incorporates the bus station and (now) the metro station. Not unlike Telford town centre, in fact, and from about the same era as well. What’s interesting to see is that the place is in really good repair and the people look smart and purposeful; in classic Singapore fashion, everything works, nothing is broken, and there’s no graffiti. Perhaps not so much like Telford, then….. It has a population somewhere around 150,000, so it’s a significant sized town. And it’s just one of a dozen or more spread across the island and all built in the last 50 years. But on to the zoo! I had heard about it when I was planning last year’s visit and had read about it. The comments ranged from “possibly the best zoo in the world!” to “but still just a zoo….”. So this time I had to go see for myself. So, back in Singapore. I arrived at 4:30-ish Tuesday afternoon after a door to door journey that took about 22 hours. There were a couple of trains from Sheffield to Manchester airport; a couple of planes from Manchester to Singapore; and finally a very comfortable transfer in a Mercedes from Singapore airport to my hotel. Having arrived I looked after some housekeeping stuff. I needed all of the following things: some cash; a local sim for my phone; a pass for the Singapore MRT (the Metro); and I also needed to collect my ticket for the Chingay parade. I knew from last year’s visit that there was a shopping mall (City Square Mall) over the road from the hotel where I could get all these things. Later in the evening I went back to the mall to eat, at one of the many food outlets there. I was tired and jet-lagged and not feeling adventurous, so I picked ‘PastaMania’ and had a very enjoyable mushroom soup and ‘creamy chicken’ with penne pasta. Together with a bottle of water that came to S$15.90, or about £8.50. I’ve found that you can certainly eat very cheaply in Singapore (you can also eat very expensively), but that alcohol is always expensive. Unless you stick to the ubiquitous Tiger beer, and in a popular tourist hotspot even that can be pricey. One of my aims this year is to visit a number of places I didn’t get to last year, and this morning I went to the first of these: Kampong Glam. Historically, this was the centre of Malay settlement in Singapore. There are a few streets of old buildings consisting of South Asian ‘Shop Houses’, where the ground floor was devoted to business and the family lived above. However none of these premises seem to be doing what they originally did, most have become shops for local designers, or they are cafes and bars. Unlike a very similar area of Georgetown in Penang, Malaysia, they are all in good repair; indeed the area is very vibrant. Alongside these streets of small buildings are a couple of much more major edifices. One is the Sultan Mosque. This dates from the 1840s (it replaced an older, smaller mosque) and claims to be both the oldest extant mosque in Singapore and the most important. 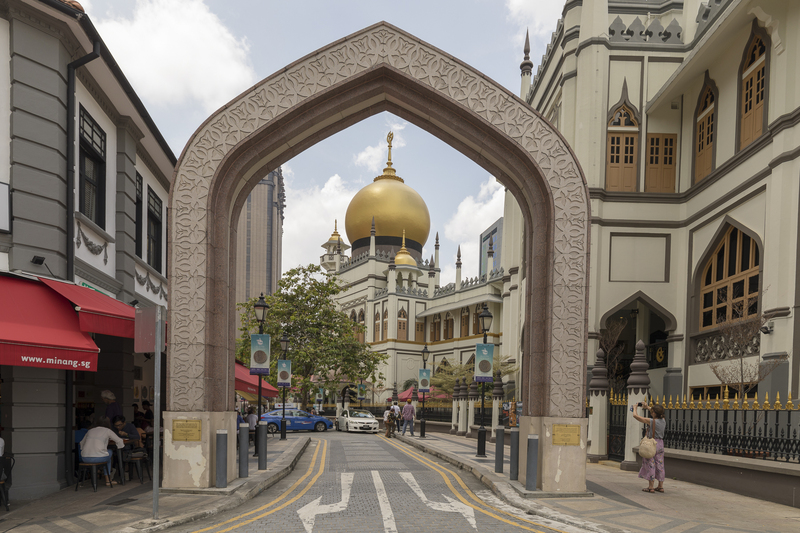 It’s a very odd structure – despite being built to serve a Malay population its design is apparently based on the Taj Mahal, and it has an onion dome despite the fact that such a feature has no place in traditional Malay architecture. Alongside the mosque are a couple of other buildings dating from the same era. One is the Istana Kampong Glam, the residence of the local Malay Sultan who did the deals with Raffles in 1819 and 1822 that allowed Singapore to come into being. Today it’s the home of the Malay Heritage Centre, which I visited and enjoyed.